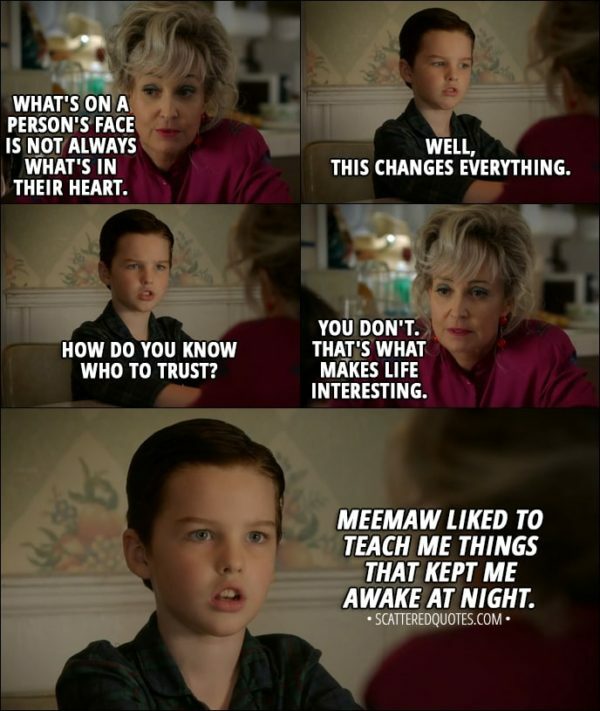 Meemaw: There's something about him. I mean, he's smart as hell, and gentle and funny. Not always on purpose, but he's funny. I never met anybody like him. George Cooper Sr.: Sounds like Sheldon. 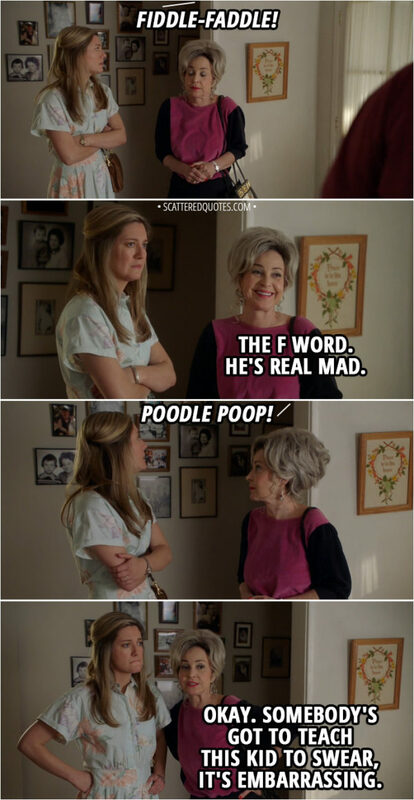 Meemaw: Now, why would you go and put that thought in my mind? 23.9.2018 Why would you go and put that thought in my mind? 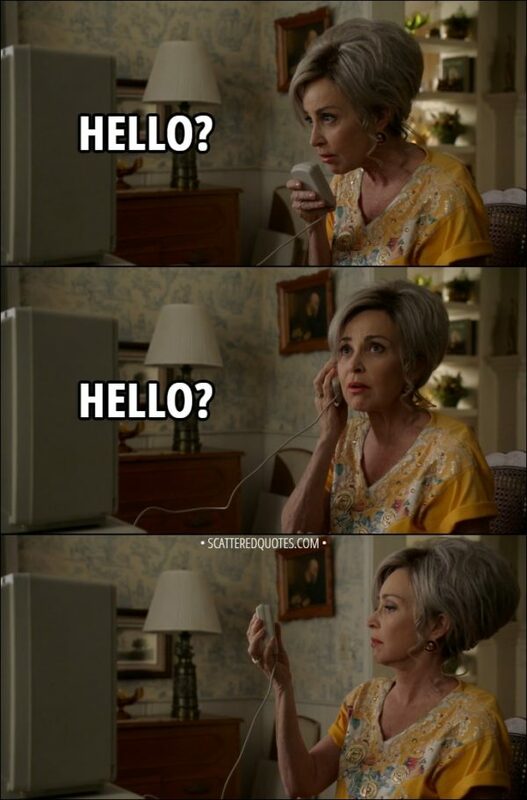 Meemaw: Not a word. But he had on a tweed jacket with the elbow patches, so he must know what he's talking about. Georgie Cooper: Hey, now that you're treating him like an adult, can I have his allowance? George Cooper Sr.: That allowance is for chores, which you already don't do. Georgie Cooper: Come on. We all know I'm your favorite. 23.9.2018 You’re not even his third favorite. 23.9.2018 Somebody’s got to teach this kid to swear, it’s embarrassing. Mary Cooper: Shelly, if you don't mind me asking, what's your long-term plan here? Sheldon Cooper: I'm working on the math to turn the garage into a self-sustaining ecosystem. Mary Cooper: Okay. And what exactly does that mean? Sheldon Cooper: Well, all I need is sunlight and a few seeds to grow unlimited food which I'll fertilize with my own feces. Meemaw: This just gets better. Mary Cooper: If you're not gonna help, please go inside. This is not a show. Meemaw: Now that's where I disagree. 23.9.2018 This is not a show. – Now that’s where I disagree. Mary Cooper: I'm so happy you're taking an interest in religion. Sheldon Cooper: I am. And I've decided to explore other religions, too. Mary Cooper: What's this, now? Sheldon Cooper: Pastor Jeff encouraged me to approach religion scientifically, so it only makes sense to enlarge my database. Mary Cooper: No, your database is Baptist. That's all the data you need. Baptist data. George Cooper Sr.: What other religions you considering? Sheldon Cooper: Buddhist, Jewish, Hindu, Catholic, all of them. Mary Cooper: Nope. Nope. That's not happening. Sheldon Cooper: Well, why? As an American, don't I have freedom of religion? Meemaw (to Mary): Those dungeons and dragons are looking pretty good right now, aren't they? Sheldon Cooper: I'm also looking into voodoo. 20.1.2018 I’ve decided to explore other religions, too. Meemaw: Maybe y'all are being a little selfish about this. Mary Cooper: Selfish? We're thinking of him. Meemaw: Well, that's all well and good, but maybe you should be thinking about the whole world. I mean, what if Einstein's parents had held him back? We wouldn't even have the... Well, I was gonna say atomic bomb, but there's probably a better example. 20.1.2018 What if Einstein’s parents had held him back?